I am an traditional hand engraver and embellisher of guns and rifles. This includes gold inlay, carving, pictures of game, all forms of lettering and silver inlay into the woodwork. 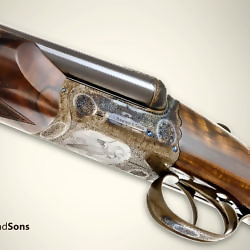 I engrave for the leading London and Birmingham gunmakers as well as some abroad. I engrave traditional scroll work as well designing of my own patterns.